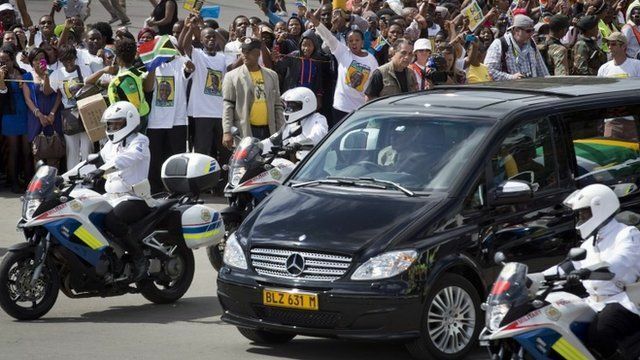 Nelson Mandela's body taken home Jump to media player Nelson Mandela's coffin arrives in the Eastern Cape region for the final leg of the journey to his ancestral home in Qunu ahead of his funeral on Sunday. 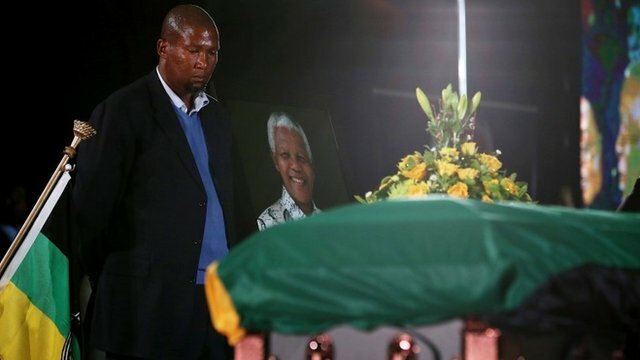 ANC hold Mandela send-off memorial Jump to media player Nelson Mandela's coffin is brought to a farewell ceremony for ANC members ahead of Sunday's state funeral at his ancestral home in Qunu. 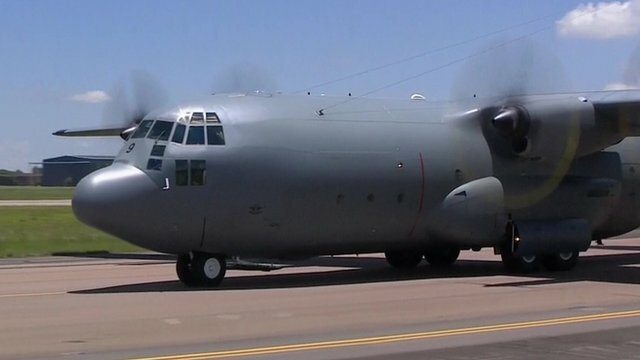 Nelson Mandela's body leaves Pretoria Jump to media player Nelson Mandela's body is flown to his ancestral home in Qunu, in the Eastern Cape ahead of Sunday's funeral. 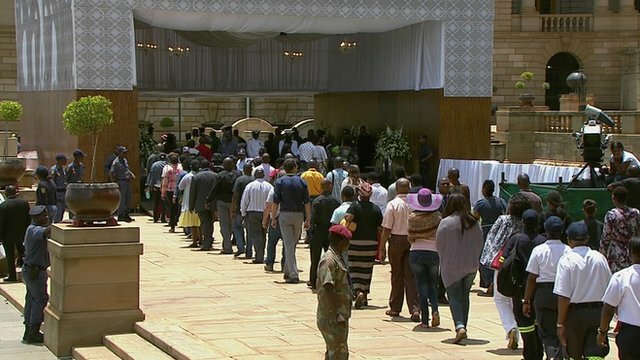 'We'll keep Mandela in our hearts' Jump to media player Watch highlights of an ANC farewell ceremony for Nelson Mandela in Pretoria ahead of Sunday's funeral at his ancestral home in Qunu. 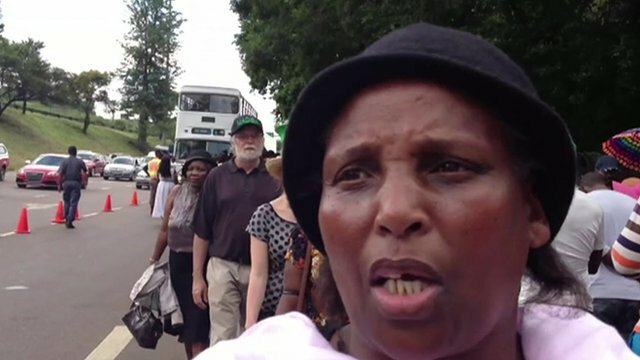 Upset mourners unable to see Mandela Jump to media player Mourners in Pretoria are upset that they have been turned away from seeing the body of Nelson Mandela. 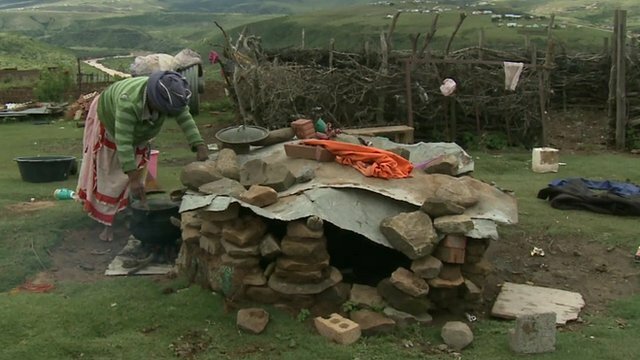 Qunu locals unhappy at funeral plans Jump to media player Discussions are taking place between government officials and local chiefs about how Sunday's funeral ceremony for Nelson Mandela in Qunu should be conducted. 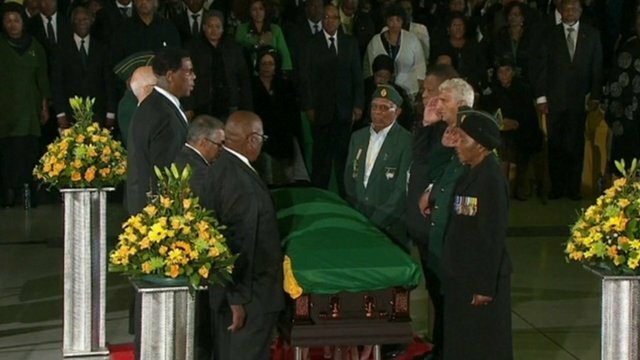 Nelson Mandela lying in state ends Jump to media player A three-day period of the body of Nelson Mandela lying in state has ended, ahead of his funeral on Sunday. Nelson Mandela's body has been taken to his ancestral home in Qunu, in the Eastern Cape ahead of Sunday's funeral. The casket, accompanied by senior clan and family members, was greeted at Mthatha airport by a military guard of honour. Crowds have lined the streets to pay their respects along the route to Qunu.